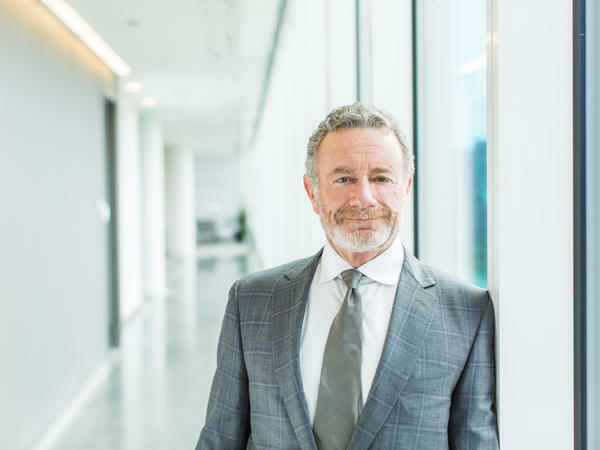 NPR CEO Jarl Mohn announced he will step aside next year to focus on a newly created position to lead NPR's fundraising drive. NPR's chief executive, Jarl Mohn, announced Tuesday that he would step aside next June at the end of his five-year term to focus on a newly created position to lead the public radio network's fundraising drive ahead of its 50th anniversary in 2020. Mohn announced that he and his wife, Pamela, would also contribute $10 million toward the effort. "I've had a chance to work at some great companies. But this has been the most important and rewarding thing I've done in my career," Mohn said in a telephone interview. "It really has been remarkable." In taking the CEO job, Mohn arrived with decades of experience as a broadcast executive and digital media investor, with stints at MTV, VH1, E! and Liberty Media before becoming a private investor. He has been a relentless cheerleader of the durability of terrestrial broadcasting as a platform for public radio, and his tenure has been marked by significant growth in NPR's radio and digital audiences, though it has softened of late. That growth has been accompanied by notable financial gains. The Mohn years at NPR have also been marred by a crisis sparked by sexual harassment allegations against NPR's former top news editor, Michael Oreskes. Some staffers said Mohn and his management team failed to register warning signs with sufficient speed in ways that allowed a toxic work environment to fester under Oreskes, whom Mohn hired in the spring 2015 and ousted in November 2017. NPR has subsequently put in place a series of far-reaching reforms to address workplace concerns. "I've done a lot of soul-searching because of what happened," Mohn said Monday in the interview. "My last big screw-up of a hire was 31 years before that. The organization is the better for it now. We've learned from it. But I wish it had never happened." The workplace changes have been led by NPR's then chief operating officer, Loren Mayor, who has since promoted to be president of operations. She is seen by many managers and executives inside NPR as a strong potential internal candidate to replace Mohn. The decision by Mohn, who turns 67 later this month, cuts short speculation about his future and sets in motion a search for a fresh leader. Mohn said NPR's board of directors had offered him a second term, a characterization supported in interviews with two members of the board. "It was a very tough decision, because I am conflicted," Mohn said in the interview. Mohn said that he had been commuting from Los Angeles, where he and his wife live, and that it has been taking its toll. The Mohns are active art patrons and collectors there as well as supporters of KPCC, a major NPR member station based in Pasadena. In addition, though he did not cite concerns about his health, Mohn suffered a near-fatal aorta rupture in March 2017 and had to take medical leave late last year to address high blood pressure even as the fallout of the sexual harassment scandal divided the newsroom. Mohn arrived at the network in the summer of 2014 bursting with energy. He ousted NPR's chief content officer, Kinsey Wilson, a few months later, as part of a larger turnover in the network's top executive ranks. The two leaders clashed over whether to pursue growth in NPR's radio audiences. Wilson favored a more aggressive single-minded focus on digital for NPR, arguing that radio audiences had at best plateaued, and were most likely to fall. "I don't believe flat is the new up," Mohn told staffers that fall. "Some people do." Mohn stressed the primacy of news to what NPR offers and sought to give the network the resources it needed to cover an ever-expanding range of topics. He also put the network on sound financial footing for the first time in years: It had been in the red for five of the six preceding years. NPR has boasted surpluses every year since, with revenues from corporate sponsorship more than doubling in that time. "His five years is up and we're thrilled that he's going to be able to continue, although not in the same CEO capacity," Paul Haaga, chairman of NPR's board of directors, said in an interview. "He's leaving us in fabulous shape, financially and newswise." Haaga said the board had sought to persuade Mohn to continue. "Nothing lasts forever," Haaga said. Audiences for NPR's newsmagazines are up more than 20 percent for listeners over the age of 12 from spring 2014, the last period before Mohn's appointment took effect, to this past spring, the most recent comparable stretch. And NPR is the nation's leading podcast publisher, with 18.9 million distinct users streaming and downloading 165 million episodes each month, the network said, citing figures from Podtrac, an industry monitoring service. Mohn placed great emphasis on collaborative initiatives with member stations, for which station managers in interviews have expressed appreciation. One of his signature ventures involved to seeking to generate more awareness for the public radio system's programs, especially its mainstays, Morning Edition and All Things Considered. Yet it is hard to disentangle that progress from its coinciding with the ascent of candidate and President Trump, which has caused a spike in interest for many major national news outlets, including The New York Times, The Washington Post and cable news channels. That has softened for many such news organizations including NPR, a phenomenon associated with so-called "news fatigue." NPR has opened new bureaus and added reporters to cover Washington politics in the Trump era. Even so, Mohn and his executive teams have encouraged experimentation in platforms, formats and content. The network now streams shows on smartphones and smart speakers. It has minted new hits such as the podcasts Hidden Brain, which explores the unconscious choices that drive human behavior, and How I Built This, which dissects entrepreneurial innovation. Several podcasts have been backwards-engineered into becoming shows for conventional radio stations — a reversal of the typical path. There are many new players in the podcast industry, however, including startups and major media players such as CNN, The New Yorker and, notably, The New York Times, whose news podcast The Daily, a sensation produced by former NPR and public radio staffers, jolted NPR executives about the briskness of digital competition. The scandal involving Oreskes inflicted perhaps the most grievous wound. Oreskes was hired in spring 2015 to lead NPR's newsroom after a long career in print journalism, with senior news jobs at The New York Times and The Associated Press. The year he arrived, NPR formally rebuked Oreskes after two female NPR journalists filed complaints against him. But that only became public in October 2017. The Washington Post reported that two women accused Oreskes of forcibly kissing them in separate incidents two decades earlier, while he was the Washington bureau chief of The New York Times and when they were considering whether to pursue jobs there. Subsequently, multiple female journalists at NPR said Oreskes had left them deeply uncomfortable by embarking on intimate conversations over extended dinners or by engaging them repeatedly in exchanges via unsolicited private message. And four editors went to senior managers with concerns of a toxic work environment, even as they did not know of specifics. Mohn later said that because NPR's corporate leadership had no knowledge of incidents of misconduct by Oreskes after he was formally rebuked in fall 2015, executives mistakenly believed they did not have cause to act. A review by an outside law firm issued in February 2018 found deep mistrust of management. "We can learn from it, and we will," Mohn said then. "While we cannot change the past, we can commit to not repeating it." Women at the network expressed deep anger at the time, saying NPR's actions belie the legacy of female journalists there. The allegations were nowhere near as severe as those facing other prominent figures whose careers collapsed under the weight of accusations of more vile sexual harassment, including, in some cases, coercion or assault. Among the prominent journalists who were forced out are Fox News' Roger Ailes and Bill O'Reilly, NBC's Matt Lauer and CBS' Les Moonves and Charlie Rose. Yet the Oreskes allegations, and the fact he was allowed to continue for another two years after complaints were first lodged, created a toxic climate, some female NPR journalists say. A senior news editor and a reporter also left NPR amid similar claims of inappropriate behavior. There were also complaints against an NPR board chairman. He abruptly announced he would not seek another term as chairman in November 2017 but served on the board for another year. He said it was his decision not to continue and said it was not based on any complaints. He also denied any misconduct. "This cuts deeper," NPR Morning Edition host Rachel Martin said at the time, in an interview. "We have thought of ourselves — perhaps naively — as exempt from something like this." The network has worked to address concerns beyond the strict confines of harassment issues. Major steps taken by the network include a survey of the workplace climate and a pay equity audit, a clearer process for reporting complaints, stronger anti-harassment training, a morals clause in all contracts and the conversion of many temporary positions to permanent ones. The temporary employee corps made up a surprisingly large proportion of the newsroom workforce and is disproportionately female. Relying on Mayor's leadership, and his own contrition, however, Mohn has weathered the storm. He says he is proud of the management team he has put together at NPR, including Mayor, whom he elevated from the network's chief strategist to be chief operating officer within a few months of his start. Mohn's team also now includes a newly appointed chief of news, who started last week: Nancy Barnes, formerly the top news executive of the Houston Chronicle. Mohn said Monday that the success his team has achieved left him confident he was making the right choice. And he said he would set his ambitions high: he wants to raise more than the roughly $225 million bequeathed to NPR by Joan Kroc — the largest gift in the network's history.